Bodybuilding.com 12 Week Transformation Challenge! Bodybuilding.com and award-winning supplement company Optimum Nutrition are teaming up to give you 100,000 reasons to transform your body. We are giving away $100,000 in cash and prizes to the winners of our $100,000 Transformation Challenge! Join the Bodybuilding.com $100,000 Transformation Challenge & Change Your Life! Here To Promote The Contest? Promote the $100,000 Transformation Challenge on Facebook & Win A Trip For 2! "How do I win?" you say! EASY - It will literally take mere minutes of your time! 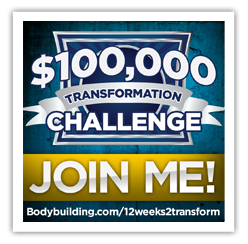 Post the Bodybuilding.com $100,000 Transformation Challenge badge found below as your Facebook profile picture for a minimum of 7 days. Post the official Bodybuilding.com $100,000 Transformation Challenge link (www.bodybuilding.com/12weeks2transform) in your status post on your personal Facebook profile page. Obtain a minimum of ten "likes" on your above Transformation Challenge Facebook post. *You must accomplish all above four items between January 17, 2011 and January 31, 2011. Winner will be announced via Bodybuilding.com's Facebook Page on January 31, 2011. UPDATE: Congratulations to Mitch Emery for winning this promotion! Click here to see the announcement. If you need another reason why you should participate, just check out the details on this sweet prize! 3 Night Stay in a Suite at the Arizona Grand resort!